I rebuilt two Albrecht R8 chucks without instructions. Glad to have your article, especially lubrication and holding plates. Great article! I just bought one that was mounted to,I beleive, a CAT 30 holder. It doesn’t need a rebuild, but here is an easy way to remove an arbor while the chuck is assembled. I used a bearing seperator/splitter to remove it and it worked like a charm. Thanks Bob, hope it comes in handy if you ever do need to get that chuck apart. 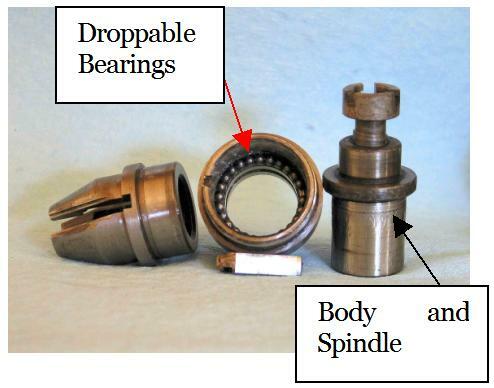 I’ll remember your bearing separator trick – never thought of that! 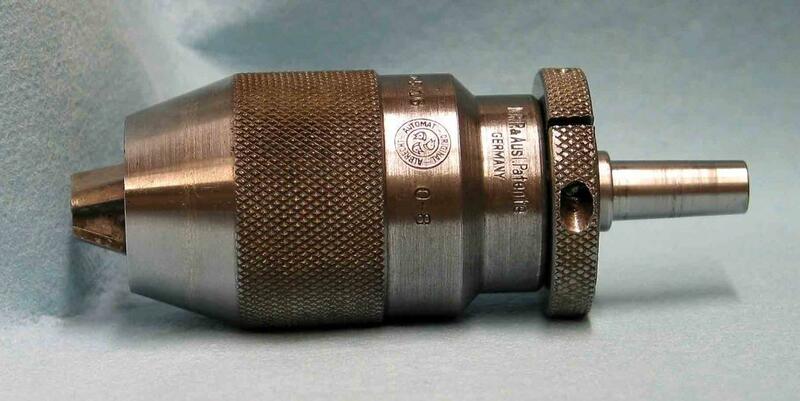 My Albrecht has an integral R8 shank and no locking screw in the collar. Does the collar still come off? How? Hi Nick. I haven’t had the opportunity to work on a chuck with an integral shank so do not have first hand experience with this but if there is no collar locking screw then I would guess it won’t come off. That shouldn’t impair your ability to overhaul it, however. Good luck, and let us know how it goes. I’ve got a Albrecht 130 J2. My drill press has an one piece shaft with a J33 machined on it. Is reaming the body to J33 crazy or should I just replace it with the correct body size? First of all, you do nice work! I enjoyed your site and definitely admired your work. Most drill press spindles have a female Morse Taper into which an arbor will interference fit. These arbors have a male Morse taper on one end and a Jacobs taper on the other. It is then a simple thing to buy the arbor you require so that the Morse taper matches your drill press and the Jacobs taper is a 2 Jacobs Taper to fit your chuck. No need to drill the body of the chuck – just change the arbor. If your spindle is indeed one piece without an interchangeable arbor then the simplest thing would be to replace the body. I would be surprised if this were the case and would check to be sure there isn’t an arbor in there. If the side of the quill has a slot you should be able to see the end of the arbor in there and it can be removed with a arbor key. I hope this helps. Let me know if there are any other questions. 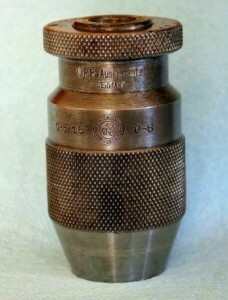 The collars of the R8 integral shanks are pressed on. 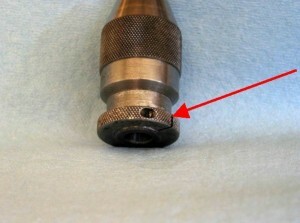 Disassemble normally and the collar can be pressed off by supporting the shell in pressing on the end of the shank. I took 2 off old chucks this week. You really mean the “shell” and not the “body”. If you were to grab the body and hood only, you risk the chance of over torquing the internals and damaging the chuck. Other wise this is a GREAT write up! Thanks for the kind words, Keith. 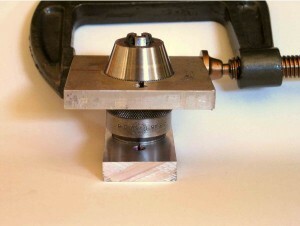 You are correct – the smaller plate clamps onto the lower part of the shell. I cannot edit the article so Rob will need to do that. Thanks for pointing it out. I found this very helpful. I was using my chuck on my mill, when i went to remove it, it came apart. What a great time to clean and inspect it. Problem is, when it came apart, all the ball bearings scattered. I recovered all but one of them. Anybody have a spare they would like to send me or let me know where I can get one? Albrecht has specific size bearing balls in metric and McMaster doesn’t carry them all. Msc has all the parts. Bearing balls are the least expensive parts for an Albrecht. $10 per pack. Thanks for the info. I reassembled it with a replacement ball I had that was 10 thou under size, just to use as a spacer. After reassembling, the missing ball showed up. I’ll save that replacement job for another time. Those little suckers are amazingly adept at hiding, often doing so in plain view. When hunting them I find a magnet on the end of a stick is helpful. I did one chuck and, for some reason, dropped all 25 bearings FOUR times – when I said “Caution” and “droppable bearings” I wasn’t joking! That chuck now runs with less than 0.0005″ TIR on my drill press but it took DAYS to get it there. Nice article! To remove the arbor, one method you can use involves two proper diameter rods. Position the rods so they are trying to press into the grooves just above the split collar – protect the surfaces of the chuck with a paper towel. Then squeeze the rods into the grooves using a vise. As the rods push in, they will force the arbor out with a loud pop. Thanks, Ray. I’ll have to remember that one. I have one off ebay that has .025 run out and you can see it at the end of the drill is worth trying rebuild? Tough to say where that 0.025″ of run out is coming from. In most cases the problem is not the chuck itself but the arbor or spindle/bearings. You might want to disassemble and clean the chuck up, then reinstall it with a new arbor and check the run out again. Albrecht chucks are almost always worth rebuilding, in my experience. This article was extremely helpful – thanks!! I wonder if Albrecht actually tried their removal method. (hold in soft jaws of vise and use strap wrench – lol!!!) It was a complete failure for me. 1. leave the arbor attached to the chuck and attach the assembly to the drill press or drilling machine. 2. Use a chain type of vise grip clamp to hold the chuck’s body. (The chain has lots of contact points around the entire circumference and won’t mar the chuck body.) Tighten it real tight. 3. Attach a stainless steel worm drive clamp to the knurled hood. Use a pipe wrench clamped to the worn drive. (the clamp protects the hood from pipe wrench marks). 4. Hold the chain vise grip with one hand and torque the pipe wrench with the other. If it’s still stubborn run a propane torch around the hood a couple times and use a dead blow hammer on the pipe wrench. This method leaved the chuck completely unmarred. Thanks for the kind words, Dave. I’ll bet Albrecht uses some type of clamping system like you. It certainly sounds easier than boring aluminum. Thanks for the tip, Dave. I have all the removal plates I need but this might save me on the next stuck thing! Mikey’s way works really well, but I just did as Ray Johns suggested with chucks where the arbor is just to big for the slit collar to come off, to be able to get the aluminium one on. I would think that there has to be at lease a couple of mm for it to work though. Thank you both, that came in really handy. Has anyone tried regrinding the jaws where they contact the bit? Mine are a bit chewed up but salvageable I think. I haven’t tried this. Albrecht jaws are hardened so the only practical way to re-shape them is to grind them. Since this has to be done very accurately, beyond what could be done in the typical HSM shop, I would think simplest solution would be to replace the jaws. For a stronger strap wrench I use a length of 1″ wide nylon webbing with a slotted piece of 1/2 x 3/4 steel. The slot is big enough for two thicknesses of webbing to fit through. I roll the webbing around the steel two or three times to tighten it against what ever I am trying to loosen. I then use a 1/2″ open end wrench on each end of the steel to apply the loosening force. This has worked for me on all but the smaller items I’ve tried it on. Thanks for the tip, Paul. It looks like this would give you a lot of leverage and is one I haven’t heard of before. Add one more to the arsenal! Hi Larry, welcome to MachinistsBlog! You are correct – the body should fit inside the shell without slop but should turn and come apart easily. If I had to guess I would bet the previous owner grabbed the shell in fixture or vise and applied a lot of pressure to get the hood off, bending the shell in the process. It is unlikely that the body is deformed as it is solid steel. Can you put your parts in a V-block and use your DTI to see if the shell is out of round? If it is then you will need to either press it back into shape or replace it. Thanks for the tip, Mikey. There are no obvious scars on the shell, and the hood still threads on nicely, but the body does rock a tiny bit when set in the opening in the shell – one of them HAS to be out of round. I’m not a machinist (wood turner), but will get a dial indicator and check it out and let you know. Thanks again – I appreciate the reply. You’re welcome, Larry. The more I think about it the more I suspect a distorted shell. 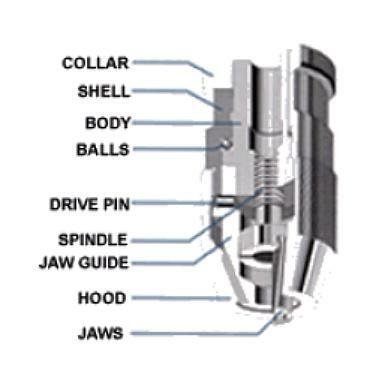 I can think of a number of ways to protect the shell from scarring while applying a great deal of force to clamp it. I cannot think of how the body might be bent. Please let us know how this turns out. 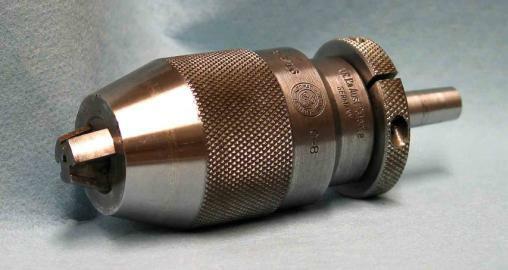 I have purchased several Albrecht style keyless chucks made in Taiwan for my drill presses from mail order tool vendors. These have worked well for me. My largest was 5/8 capacity. So far it has served me well. I have absolutely no idea if Sears rebadged and sold an Albrecht keyless chuck. However, I would be very surprised if Albrecht would do that given that their reputation would then be on the line. If I had to guess I would bet it is a knockoff from Asia. Perhaps others may have a better idea about these chucks. Anyone? Great writeup bought two Albrechts off ebay cheap and used your instructions to strip & clean them. One the chucks looks like stainless steel. Glad it helped, Paul. I’m sure they’ll serve you well. Thanks! Rebuilt a 130-J33 for my little drill press. I got it because it was missing the collar and had a broken off arbor in it. I welded and was able to slide hammer the arbor out. Then I found that the roll pin inside was sheared and the LH screw was maxed out and stuck. Fixed all that and she works like a charm!! You are a genius! Thanks for the great advice. Worked like a charm. Glad things worked out, Bob. Uhhh – what worked? You can buy them at almost any industrial supply house – MSC, Travers and others. However, I would try ebay first. I’ve seen jaws go for stupid cheap prices there. The Spiro is a good chuck – I have two of them and like them a lot. Yeah, I sort of overkilled that oil in the spindle thing, didn’t I? My Albrecht 100 chuck keeps slipping even though I degreased and left dry the spindle thread. Not sure what more can I do, other then replacing the jaws?! If I recall correctly, the 100 series is a 3/8″ chuck, right? The primary reason these chucks slip is oil in the spindle provided all other components are in good shape. If the drive pin is worn and loose or the jaws are worn/damaged then the drill can slip. Can you see any damage to these components? I bought the chuck used, on eBay; doesn’t look to have seen lots of use, but it’s all pitted (probably was dropped into the coolant tank and forgotten for years). The jaws look good (except the pitting) and the pin is intact. How tight does one have to close the chuck so the drill won’t slip? Just firm hand pressure should lock the chuck. I have had 7 Albrechts and none have slipped after I got through with them. Pitting shouldn’t be doing this. Is the drive pin fairly snug or can you move it around? Are there any defects inside the hood where the jaws touch? Pin is snug and there is just some pitting on the inside taper of the hood; probably I have not tighten it enough… I had a reamer slipping, which was quite frustrating I am applying a brisk twist to the chuck to lock the tool and it holds better than just turning to lock. Hmmm, it should lock with a firm twist and unlock easily. Since the chuck was in good condition except for the pitting it makes you wonder if the pitting is actually interfering with fits somewhere. If it was me I would try sanding the inside of the hood and the outsides of the jaws with some 320 grit sandpaper to get it smooth and see if that helps. Yours was nowhere near as badly stuck as ours. Years of sitting on a shelf fully open caused the grease to cake up and every moving part was stuck. Four fixtures and an afternoon later, we got it apart, and everything looks to be in good condition! Getting the arbor out did require use of a hydraulic press. Made quite a POP when it came out! Nothing draws a crowd like a crowd.